Is your website mobile-friendly? Our team of industry experts are committed to designing and developing responsive websites & web applications that perform seemlessly across all majore devices. Sites & apps that attract, engage and convert. Responsive web development is something the average internet user almost expects, doesn’t even notice or takes for granted. In a day and age where we access the internet from all different types of devices such as traditional desktops, laptops, 2-in-1 tablets, iPads, smartphone and e-readers, most users fail to take notice that majority of websites have the ability to detect the type of device you are using and display the content of a given website in the most optimized version for that given device. This creates a streamlined approach for the user, allowing them to never miss a beat while still experiencing the full range of display, content, and design of the website regardless of the means in which they are connected. A web developer must ensure that the project is equipped with a flexible grid. This truly is the foundation for which optimization can happen upon. It enables a website to automatically size the dimensions of the given device. It operates on a relative sizing scale that makes display possible and coherent to the average internet user. Without fluid grids, responsive web development does not exist. 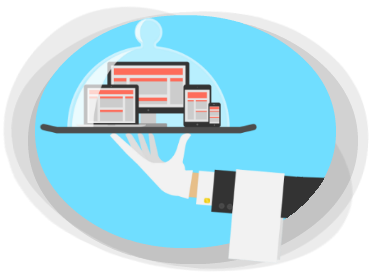 Breakpoints allow a website to detect the type of screen and device that the website has been directed to. Once the website recognizes the type of device, it will then adjust the content accordingly. The way in which the website is presented depends entirely on the device. This allows for the seamless resizing of websites to fit multiple mediums without compromising the conceptual design of the website itself. This takes images and other multimedia content fitting to a new level by allowing the website to adapt to the way the images are loaded to produce the best display possible for the particular device. This happens when the website automatically scales the picture to size or uses the CSS overflow property to make this possible. One size does not fit all. We’ve known this forever and with mobile devices, laptops, desktops and all other means of accessing the internet, this applies as well.Business owners need to reach their customers no matter what device they are using to find them.SEO rankings on a mobile device are just as critical to the growth of your business as they are to a desktop. In fact, they are one in the same. Google will push your business to the bottom of the barrel without a mobile-optimized version of your website. This has the ability to offset the best of content marketing strategies. When you contract the services of a smart, proactive marketing strategy team they will perform a top to bottom audit of your marketing activities and responsive web development will be right up there without SEO optimization, content marketing, and email marketing. Do not get left on the outside looking in. A comprehensive strategy of creating a smart, innovative online presence is pivotal to a company’s success. The internet is often the first point of contact for the majority of businesses. 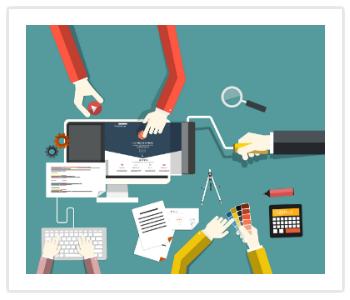 So first impressions matter and responsive web development is just one piece of a very large marketing puzzle. The services of an experienced, well-qualified marketing strategist will save lots of time, money and additional resources so you can get back to doing what you do best, which is running your business. 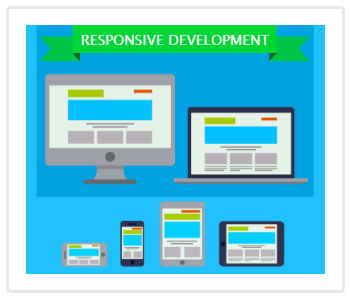 While responsive web development services are a relatively new industry for business owners and their web development provider, the idea has been around for quite some time. Only in the recent few years have web developers and business owners become keen to the fact that a responsive web design for a website site is no longer a bonus or luxury thrown in at the end of a web development package. It’s a necessity to keep your customers focused, connected and locked into a company’s website no matter where they decide to access it. This is due to the widespread explosion in the past decade of smartphones, tablets and other mobile devices. Responsive web development traces its roots back the debut of the iPhone. The idea was to build clones of websites catered to the exact device an individual was using. However, with the advent of SEO as a means of reaching customers and improving search engine rankings, this proved to be a burden on determining SEO ranking. The reason being, as each site had to be optimized independently for search engines. A company can have the same web address but the mobile version was SEO optimized independently from the desktop version. That was a burden on web developers and business owners as well who were asked to pay twice for the same service. This created high maintenance costs for developers and businesses alike and forced innovative web professionals to find a more practical solution that can be implemented universally regardless of device type. In 2010 a web designer names Ethan Marcotte was credited with coining the term “responsive design” after he published an article discussing the fast-moving world of smartphones and mobile device development and the urgency to find a way to keep pace. The previously mentioned model was not sustainable, according to Marcote. Screen sizes, resolutions, orientations were constantly changing creating a challenge for web developers. With this said, what he proposed would become the foundational framework for which responsive web development would be built on. The idea was characterized by a fluid design that was capable of automatically transforming its display to fit the needs of whatever mobile device it was displayed on. It was revolutionary for developers who found a system that would allow for flexibility while maintaining the theme and content of any given website.